The Budapest Grand Prix 2016 concluded on Sunday with the heavyweight elite powering to Grand Prix glory at the Papp László Sport Aréna as Olympic and world champions fought for the last time before the Rio 2016 Olympic Games. Japan topped the medal table with a youthful and experimental team as they won four gold medals, three silver and two bronze ahead of Slovenia who secured two gold medals and three silver. Germany finished third after claiming one gold medal, two silver and one bronze medal. 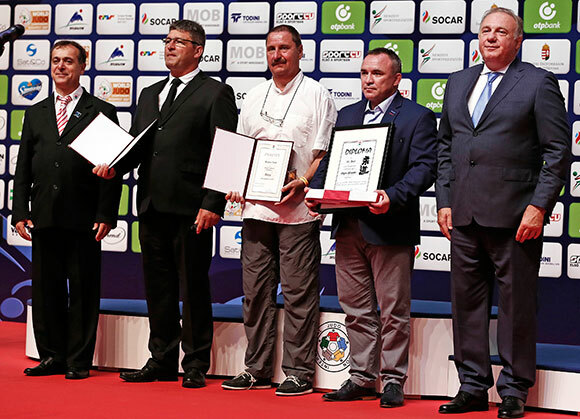 Before the final block on the second and final day of the Budapest Grand Prix 2016, Dr. TÓTH Lászlo, Hungarian Judo Association President and Mr. NAGY Gyorgy, Hungarian Judo Association General Secretary, presented a 6th Dan diploma to Mr. ILLYES Miklos and a gold medal and Hungarian Judo diploma to Mr. ZSOLT Antoni and ISTVAN Pusztai. 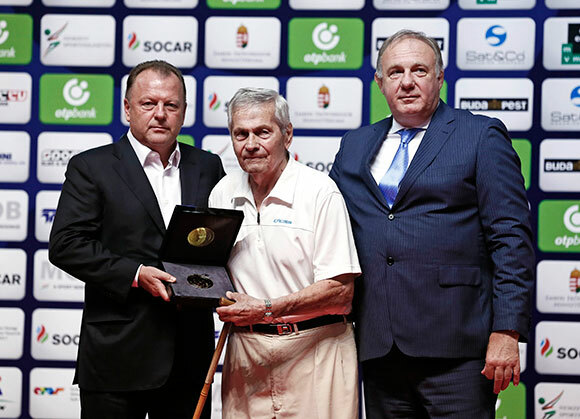 Mr Marius VIZER, IJF President and Dr. TÓTH Lászlo, then presented the IJF Gold Medal to 9th Dan Mr. FERENC Galla for his 87th birthday. The IJF World Judo Tour now heads for Asia as Mongolia will host the final Grand Prix before the Rio 2016 Olympic Games. The annual Ulaanbaatar Grand Prix will take place from 1 – 3 July and will engage 135 judoka in action including a 56-strong home Mongolian team which features former world champion MUNKHBAT Urantsetseg and Olympic bronze medallist SAINJARGAL Nyam-ochir as they compete for the final time before the Olympic Games. Former world silver medallist Laura VARGAS KOCH (GER) lived up to her top seed billing until she met teenage sensation and Baku Grand Slam bronze medallist Elvismar RODRIGUEZ (VEN) in the -70kg final. RODRIGUEZ, 19, who has nurtured her talents this year at the IJF Training Centre in Dunavarsany, Hungary, became the first Venezuelan judoka to reach a Grand Prix final and the fearless teenager did not stop there as she upset VARGAS KOCH who was comparatively fighting in the seventh Grand Prix final of her career. Nanjing 2014 Youth Olympic Games bronze medallist RODRIGUEZ, who has been financially supported on her road to Rio by the IJF, threw VARGAS KOCH with a morote-seoi-nage and trapped the German in a kesa-gatame hold on the edge of the tatami to seal a remarkable result for the teenager who is one of the most exciting young talents in the sport. The first bronze medal was won by Asian Championships bronze medallist Gulnoza MATNIYAZOVA (UZB) who outthought and outfought former world silver medallist NUNIRA Karen (JPN). The 21-year-old Uzbek, who also fights out of the IJF Training Centre in Dunavarsany, made sure Japan’s only female representative on day two was not among the medals as she edged out her opponent with a yuko score which was the only score of the contest. The second bronze medal contest featured Almaty Grand Prix bronze medallist Maria PEREZ (PUR) who is in the form of her life going into her first Olympic Games. The Puerto Rico fighter threw Madrid European Open winner Sanne VAN DIJKE (NED) with a drop seoi-nage for the maximum score after two minutes had elapsed and now heads to Rio 2016 with high expectations. Olympic champion and Rio 2016 Olympics top seed Kayla HARRISON (USA) won her third consecutive competition and retained her 2015 Budapest Grand Prix title with a comfortable victory over Dusseldorf Grand Prix bronze medallist Anamari VELENSEK (SLO) in the -78kg final. HARRISON, who is still only 25, had hoped fight home judoka and left-handed JOO who has given the American problems in the past but the Hungarian lost her semi-final and instead moved into the bronze medal picture. World Judo Masters winner HARRISON was 7-0 against VELENSEK coming into a repeat of their 2015 Budapest final and the result was the same as the former scored a yuko from a seoi-otoshi and was always in control of the contest without being tested to her limits. HARRISON said she was physically and emotionally spent after a long and gruelling spell of travelling and training in Europe. The American said she felt exhausted. The Budapest Grand Prix could be one of her final judo events. 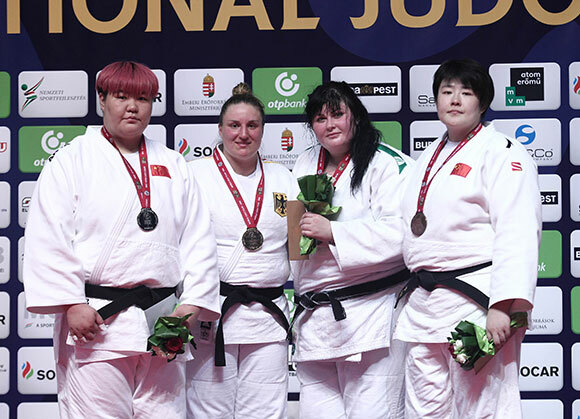 The first bronze medal was claimed by Havana Grand Prix winner JOO Abigel (HUN) who defeated 18-year-old Junior world silver medallist Klara APOTEKAR (SLO) as the hosts flourished on the second day in the heavier weight categories. APOTEKAR, who was fighting in a Grand Prix for only the second time, was thrown for a waza-ari and JOO added two yuko before finishing with a second and match-winning waza-ari. 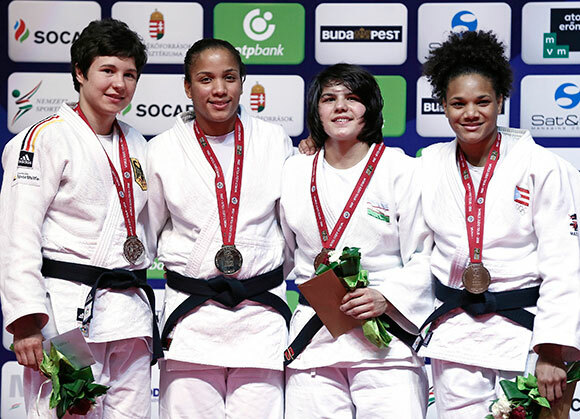 The second bronze medal contest featured former Samsun Grand Prix bronze medallist and Tokyo 2020 hope Sama Hawa CAMARA (FRA) and Madrid European Open winner Karen STEVENSON (NED). The Dutch fighter won the first Grand Prix medal of her career by ippon after 66 seconds while youngster again appeared to be in some discomfort as she grimaced in pain and held her ribs when entering and leaving the tatami. 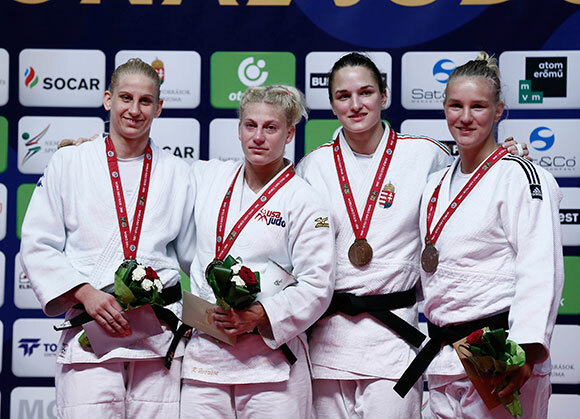 Sofia European Open winner Carolin WEISS (GER) took her career to new heights in Budapest as she won her first Grand Prix title with a classy performance in the Hungarian capital. World Judo Masters silver medallist MA Sisi (CHN) fell to two-time Grand Prix bronze medallist WEISS by a single shido as the German fighter won their first meeting between the two heavyweight forces having defeated reigning world champion YU Song (CHN) in the semi-final. The first bronze medal was claimed by Tokyo Grand Slam bronze medallist Iryna KINDZERSKA (UKR) who shaded former Baku Grand Slam silver medallist Santa PAKENYTE (LTU) by a single shido as the smallest of margins separated both judoka after four minutes. The second bronze medal contest was won by world champion YU Song (CHN) who surpassed Junior World Championships bronze medallist Yelyzaveta KALANINA (UKR) by a yuko and a waza-ari with the latter coming from a trademark harai-makikomi. Olympic bronze medallist Ivan NIFONTOV (RUS) claimed the first Grand Prix gold medal of his illustrious career as he defeated Dusseldorf Grand Prix silver medallist Sven MARESCH (GER) in the -81kg final. World number 19 MARESCH and world number 20 NIFONTOV were the first and second seeds respectively and both came through the preliminaries unscathed to book a fascinating final. The head-to-head series was locked at 1-1 coming into the gold medal match with their previous meetings coming in 2008 and 2012. Former world, European and Grand Slam winner NIFONTOV marked his first IJF outing of 2016 with the top prize as he rolled over his German rival for a waza-ari and held down the top seed for 15 seconds with a kesa-gatame to win by wazari-awasette-ippon. The first bronze medal was clinched by two-time Grand Slam silver medallist UNGVARI Attila (HUN) who gave the hosts the perfect start to the final block by defeating Sarajevo European Cup winner Bojan DOSEN (SRB). 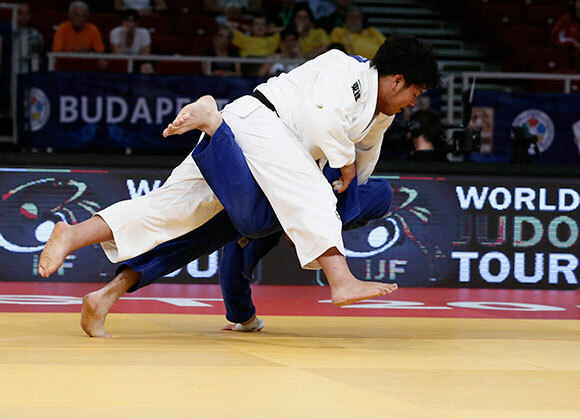 DOSEN was fighting for a Grand Prix medal for the first time and was unsuccessful in his first medal contest as UNGVARI forced his opponent to submit with a forceful piece of shime-waza. The second bronze medal was won by former Asian Championships silver medallist EBI Yasuhiro (JPN) who beautifully threw 20-year-old Junior European Championships silver medallist Nicon ZABOROSCIUC (MDA) with an ippon seoi-nage for the maximum score at exactly the halfway point having already led by a waza-ari. Former world silver medallist TOTH Krisztian (HUN) thrilled the home fans as he made sure that the Hungarian anthem would be heard at the Papp László Sportaréna. TOTH, 22, warmed up for his first Olympic Games – where he will be one of the top seeds – with a powerful display which ended with a decisive win over World Judo Masters bronze medallist Mihael ZGANK (SLO) in the final. For his age and experience, TOTH shows exemplary matside etiquette, and his immense respect for his opponents and the sport was apparent all day long including in the final when he helped a beaten ZGANK to his feet and shared a sincere conversation with the Slovenian who was beaten by two waza-ari scores. 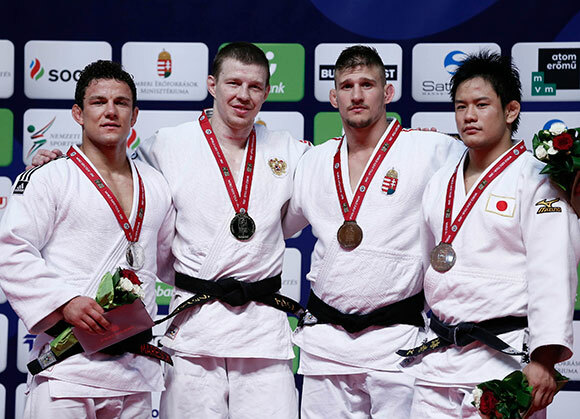 The first bronze medal was won by 2015 Budapest Grand Prix winner Celio DIAS (POR) who defeated 2015 Budapest Grand Prix bronze medallist Li KOCHMAN (ISR). 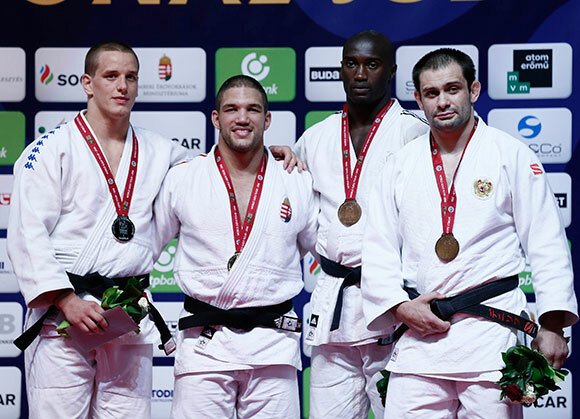 DIAS, who was verbally urged on by teammate Telma MONTEIRO from the stands, threw for an opening waza-ari score and held down a hapless KOCHMAN for 15 seconds to guarantee a second consecutive appearance on the Budapest Grand Prix medal podium. 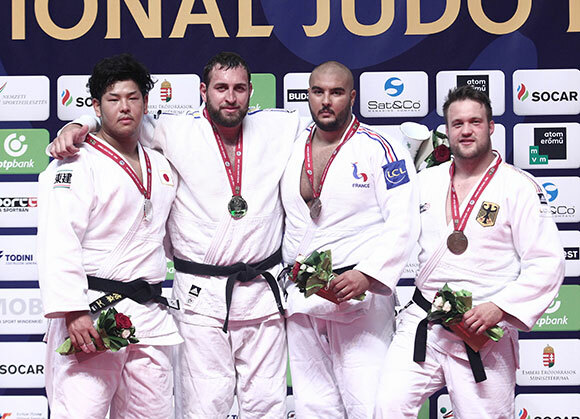 The second bronze medal was captured by European Games winner Kirill DENISOV (RUS) against former junior ace Max STEWART (GBR) who was fighting in a Grand Prix at his new weight of -90kg for the first time. DENISOV showed his class as he brushed aside the Briton who put in a tremendous effort and should finally come to the fore in the next Olympic cycle. Russia’s Olympic pick at -90kg DENISOV threw for the maximum score in the second minute to bolster his country’s medal collection on day two in Budapest. 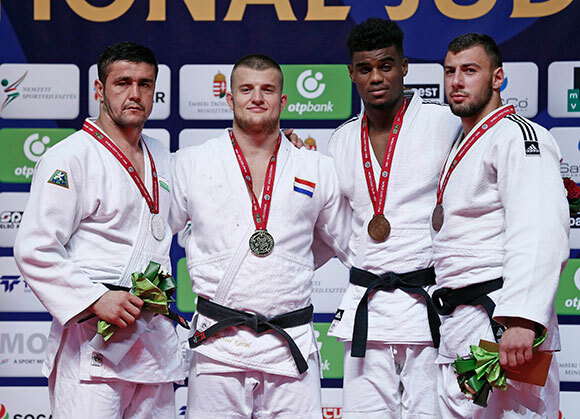 European Championships bronze medallist Michael KORREL (NED) defeated Asian Championships silver medallist Soyib KURBONOV (UZB) to win his first Grand Prix gold medal and his country’s first title in Hungary. KORREL and KURBONOV were surprise finalists as top seed Karl-Richard FREY (GER) could only manage a fifth-place finish. The finalists traded shido penalties rather than scores as they finished the regulatory five minutes with three shidos apiece which meant that golden score was required to declare a winner. After one minute and 26 seconds of added time it was KORREL who drove his way onto the podium with a drop seoi-nage sending KURBONOV down to the tatami for a waza-ari score. The first bronze medal was won by Glasgow European Open silver medallist Philip AWITI-ALCARAZ (GBR) who celebrated his first Grand Prix medal by throwing former world champion Elkhan MAMMADOV (AZE) with one of the ippons of the tournament. MAMMADOV attempted to bridge which sees the score given as ippon in order to discourage this defensive move to protect a fighter’s safety. The second bronze was won by Junior World Championships bronze medallist Anton SAVYTSKIY (UKR) who shocked Rio-bound Karl-Richard FREY (GER). SAVYTSKIY, who is one of a string of exciting prospects in the Ukrainian team, was tied after five minutes against the German judoka with a yuko apiece but FREY had been penalised three times while the IJF World Judo Tour newcomer had only been penalised once to clinch his first senior medal on the world stage. Tokyo Grand Slam bronze medallist Stanislav BONDARENKO (UKR) won his first Grand Prix title on Sunday as he bested Qingdao Grand Prix bronze medallist UEDA Katsuma (JPN) in the last final of the Budapest Grand Prix 2016. UEDA, 22, has been used sparingly by Japan and based on his performance in the final may be made to wait for another opportunity on the IJF World Judo Tour. A lethargic duel saw both men commit errors and trade shido penalties with neither judoka able to threaten the scoreboard. The contest finished with three shidos against the Japanese and two shidos against the Ukrainian who will believe that his result can reinvigorate his career at the top level. The first bronze medal was won by 23-year-old Nabil ZALAGH (FRA) who overpowered Pan American Games winner Freddy FIGUEROA (ECU) on the ground in osaekomi for 20 seconds. ZALAGH, who was aiming for his first international medal, sent FIGUEROA over with an ouchi-gari for a yuko before landing on the Ecuador fighter and remaining there with the pin for bronze. The second and last bronze medal fight of the tournament opposed Havana Grand Prix bronze medallist Andre BREITBARTH (GER) and Junior European Championships bronze medallist Zarko CULUM (SRB). Top seed BREITBARTH contained the young Serbian before unleashing his own attacks and scored a waza-ari before pinning his opponent with a kuzure-kesa-gatame for 15 seconds and a place on the medal podium.